Welcome! Please login or create an account. 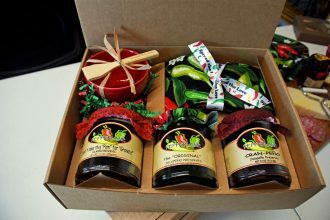 This beautiful gift set features your choice of 3-jars of your favorite Pepperlane Jalapeño Preserves, a seasonal cloth napkin, ramekin, and our signature “Spread the Love” spreader, all stylishly packaged and ready for gift-giving. Pepperlane is the perfect gift for anyone who loves to entertain and our preserves are delicious paired with charcuterie or cheese or as an accompaniment to a holiday turkey or ham. 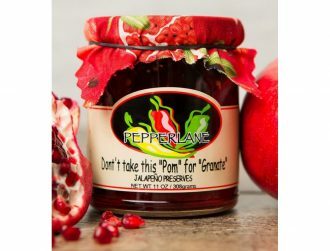 Don’t Take This Pom for Granate Preserves is an exotic mixture of pomegranate juice, jalapeños, cranberries, and habaneros. This jar holds big flavor; the tart sweetness of pomegranate and cranberry perfectly balance the flavor kick of jalapeños and habaneros. One taste and you will learn not to take this “Pom for Granate”. Pepperlane Products shared a photo. Pepperlane Products is with Sandra Turner Weese.